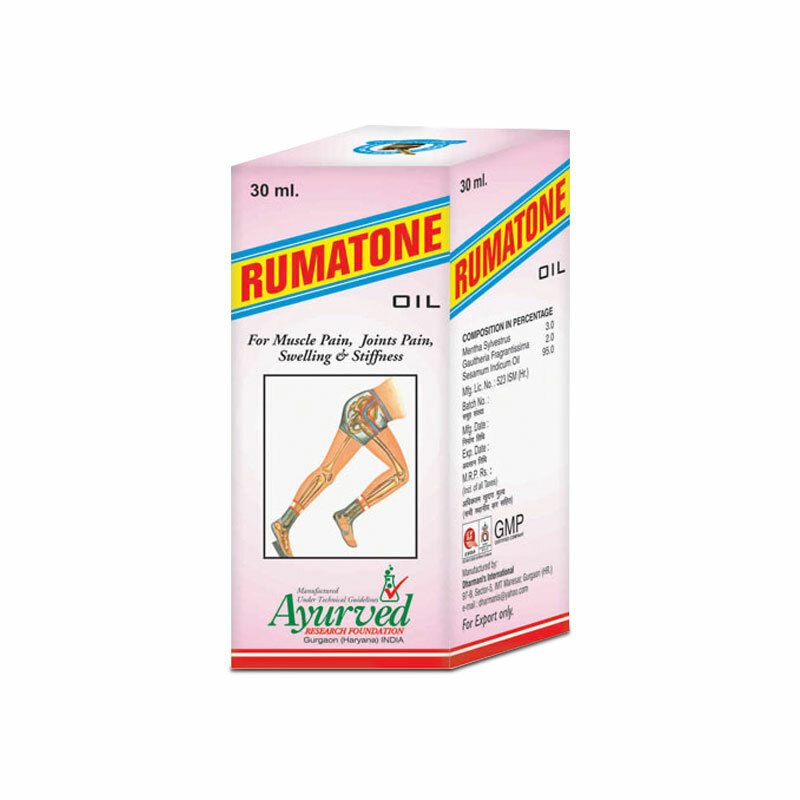 Rumatone oil is a specially formulated natural osteoarthritis pain relief oil which reduces stiffness and inflammation, relieves condition of OA and promotes movement. OA or osteoarthritis is one of the most common forms of arthritis which affects thousands of individuals every year. This inflammatory disorder raises symptoms like pain and inflammation in joints during movement, the unique symptom of OA is that this pain may get aggravated on movement after rest. Rumatone oil is highly effective herbal osteoarthritis pain relief oil which curbs pain and inflammation induced by OA. On regular use this herbal oil shows substantial reduction in the intensity of the problem. This is perfectly safe for men and women of all ages and is mild on skin. OA affects joints of the body, unlike RA or systemic lupus it does not affect any other organ of the body. Mainly this form of inflammatory disorder is very severe on cartilages. These are tissues which cover the ends of the bones forming the joints, the slipperiness of these tissues allow bones to swivel smoothly and promote painless and frictionless joint movement. Due to effects of OA body has broken or fragile cartilages which cause friction during movement, this friction causes severe pain and trigger inflammation to further aggravate the problem. Broken cartilages allow bones to rub each other which make them break and shed small pieces. These small pieces of bones may float within joint capsule to cause severe pain and discomfort and damage cartilages even more quickly. OA can form bone spurs which protrude from the skin and make joints look very out of shape. Massages with Rumatone herbal osteoarthritis pain relief oil can prevent this disorder from aggravating and checks its progression by casting positive effects. Like other forms of arthritis OA too keeps on progressing and its side effects and symptoms keep on becoming graver and severe. This can lead to complete immobility and deformity of joints. Rumatone oil not only relieves pain and inflammation caused by this disorder effectively but also checks progression of this disorder. It works by supporting body in healing damages caused by different causes of OA and also repair damages caused by this disorder. Faster rate of healing slow down progression of disorder and also relieve the symptoms. In many cases topical application of this herbal osteoarthritis relief oil allows a person to lead a normal life and perform daily activities easily and painlessly. OA is directly related to aging, elderly individuals generally suffer with this disorder due to degeneration of bones, but it is not necessary part of aging and by taking proper measures it can be prevented and person can lead an active life and perform activities without any trouble even at later age. OA present itself in the form of pain and stiffness in joints, at early stages mild pain at latterpart of the day and crackling of bones are symptoms of the problem, gradually pain arises during any part of the day and it makes movement difficult particularly after rest. Stiffness in joints while getting-up, sitting-down or walking and climbing stairs keeps on increasing and person can feel lethargy and inflammation in joints. OA mostly affects larger joints of the body first but it is not necessary. The pain becomes severe as disorder progresses and makes joints stiffer and difficult to move. Rumatone herbal osteoarthritis pain relief oil relieves all these symptoms at any stage of the disorder. Aging is natural process which can cause OA, depleting strength of bones, muscles, ligaments and reduced nutrition to joint organs can cause cartilage damage and initiate OA. Bone disorders can bring in this form of arthritis at any age, shedding of bones or bone atrophy damage cartilages covering the ends of bones forming the joints to cause the problem. Poor immunity is also one of the major causes of OA, poor functions of immune system allow infections to settle in synovial fluid which is responsible for keeping cartilages nourished and flexible to cause OA. Apart from these injuries, trauma, fractures and other types of excessive pressure can damage cartilages and promote stiffness, pain and inflammation in joints. Rumatone herbal osteoarthritis pain relief oil promotes movement by curbing pain and inflammation caused by any of these reasons. Obesity, over-use and strenuous lifestyle which require repetitive use of one or two joints also cause OA by damaging organs and cartilages. Obese people put excessive pressure on their joints which speeds-up wear and tear and damage organs. Over-use and repetitive use also strain organs of the joints to cause misalignment and damage cartilages. Heredity factors have also been found as one of the determining factors for OA. People having family history of this disorder are at high risk of suffering with this disorder at any stage of life. Treating OA at early stage saves a person from lot of trouble. Reduced range of joint motion, difficulty in moving after rest, pain in joints after climbing stairs or growing lethargy in one or few joints are early symptoms of OA which ring a bell to start the treatment. Rumatone herbal osteoarthritis pain relief oil is highly effective in checking progression of disorder and also relieving pain and inflammation to provide holistic treatment to the problem. Rumatone herbal osteoarthritis pain relief oil comes loaded with herbs and herbal oils which possess powerful properties to alleviate pain and inflammation caused by this disorder. This herbal pain relief oil possesses herbs capable of numbing nerves which carry pain-signals to brain, when pain is not sensed by the victim he or she tries to move the affected joint. This herbal pain relief oil also possesses powerful anti-inflammatory herbs. These herbs reduce inflammation and promote movement. The herbal ingredients of this osteoarthritis massage oil also promote blood flow on topical application. Higher blood flow brings more nutrition and oxygen supply for cells and nerves of the region. Improved flow of blood promotes faster cell generation and strengthens tissues and organs of the joints. These benefits alleviate condition of OA due to aging, deficiencies, restricted blood flow, injuries or infections effectively. 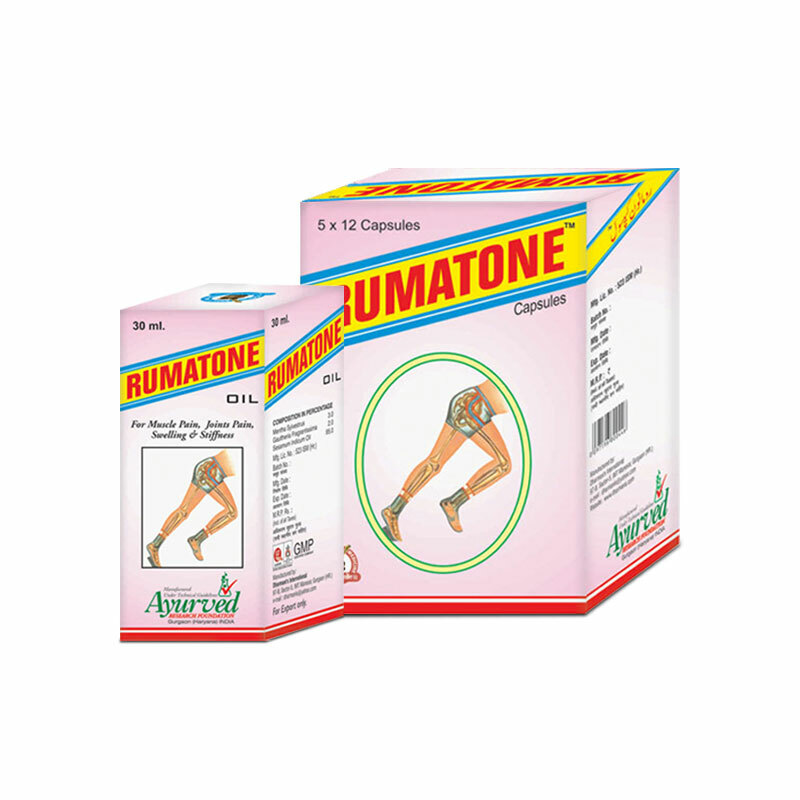 Rumatone herbal osteoarthritis pain relief oil by enhancing flow of blood and regenerating tissues at faster pace also helps body in keeping synovial fluid free of infections. Immune system also takes its effects through blood, restricted flow of blood allows infections to grow and damage cartilages by infecting synovial fluid. 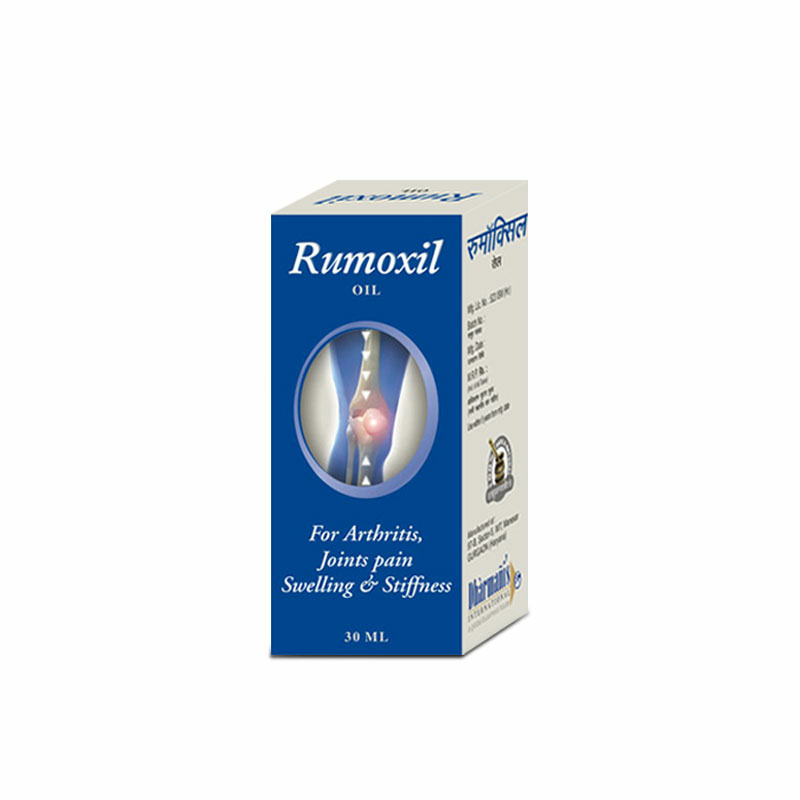 Rumatone herbal pain relief oil prevents damages due to infection and relieves condition of OA. 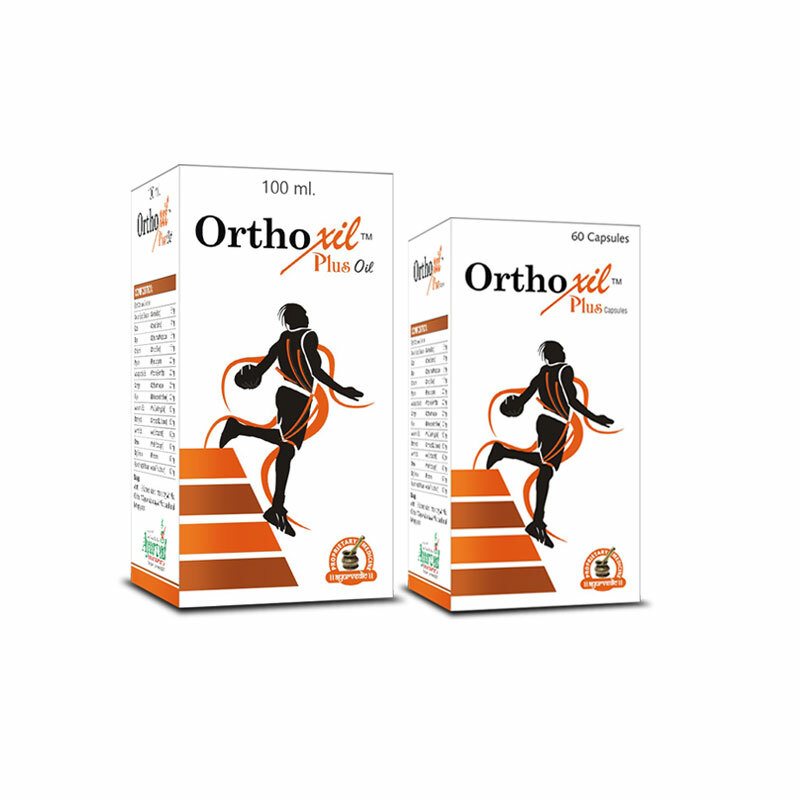 By regenerating tissues this oil helps in rebuilding and repairing damaged muscles and ligaments, stronger ligaments and muscles promote joint stability and prevent cartilage damage due to misalignment. These also improve endurance of joints and increase their capacity to bear more pressure and weight. These benefits of osteoarthritis massage oil cure lethargy and stiffness in joints and promote smooth movement. The major advantage of this osteoarthritis massage oil is its ability to rebuild damaged cartilages. By promoting healthy and strong cartilages this oil reverse ill-effects of OA and promote movement. Healthy cartilages prevent stiffness, pain and inflammation and also increase range of joint motion. Cartilages allow bones to swivel smoothly and relieve symptoms of arthritis. These benefits of Rumatone herbal pain relief oil are capable of relieving symptoms and damages caused by all types of arthritis. Osteoarthritis massage oil is beneficial for men and women of all ages and also works as highly beneficial preventive remedy. This herbal pain relief oil on regular use can prevent occurrence of arthritis in aging or prone individuals by strengthening organs and maintaining healthy joint mechanism and alignment. Rumatone oil can keep a person active and agile for longer period in life. Rumatone oil is purely herbal preparation. This comes with herbs and herbal oils as ingredients and contains no artificial substance or synthetic material. Herbal nature makes it safe for men and women of all ages and perfectly safe even for prolonged use. Rumatone osteoarthritis massage oil comes loaded with herbs and herbal oils which are – Mentha Sylvestris, Gaultheria Fragrantissima, Sesamum Indicum Oil. These herbs and oils in combination deliver wonderful results in a short time. How to use this oil to obtain good result? Using this oil is simple. Take 10-15 drops of this herbal osteoarthritis relief oil and massage the affected part with light hand. Perform massage for few minutes so that skin absorbs the oil. Repeat twice in a day regularly to gain relief from arthritic symptoms and stronger joints. This oil has wonderful and fast-acting properties. One can feel relief from first application and good results keep getting better and better with every passing day. However to gain all the benefits one needs to keep patience as treating osteoarthritis is not something which can be done overnight. The duration of complete results may vary from person to person depending upon severity of the problem. How long do this oil take to show their effects? It is recommended that one should use this oil for at least 3 to 4 months on regular basis. This oil is fast in relieving pain and inflammation but may take little time to reverse the damages caused by OA. 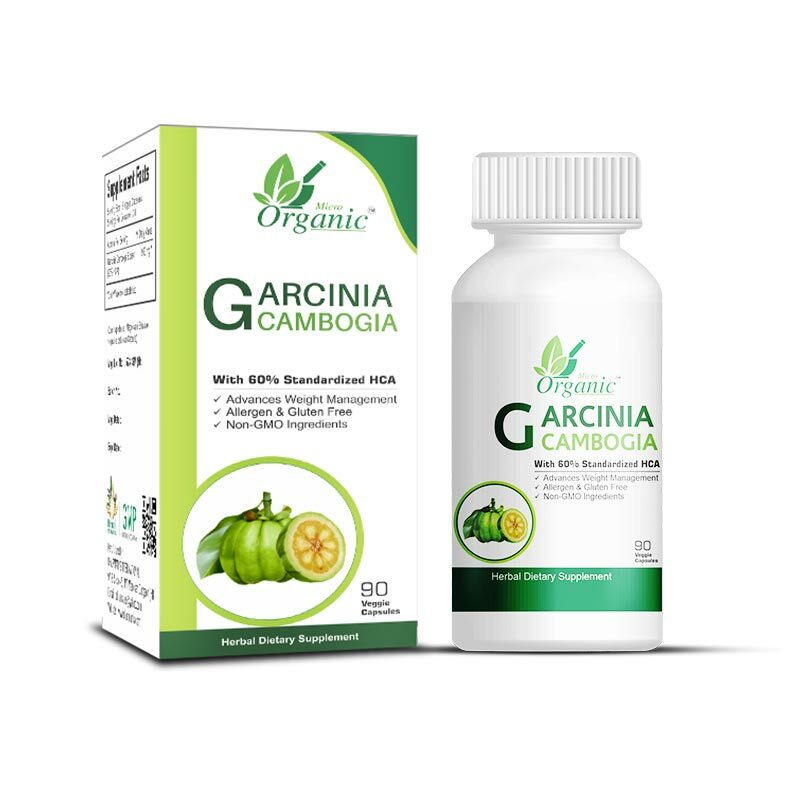 Regular and prolonged use ensures complete and maximum benefits to every person. Rumatone oil provides relief from all types of pain related to musculoskeletal system. It is wonderful in relieving pain due to sciatica, neuralgia, fibromyalgia, frozen shoulder and low back pain. This oil treats pain due to injuries, sprain and muscle pulls very well. Use of this oil as supplement is very beneficial for people involved in heavy jobs or leading strenuous lifestyle like sports persons. This relieves lethargy and weakness occurring due to muscular exhaustion and strain. 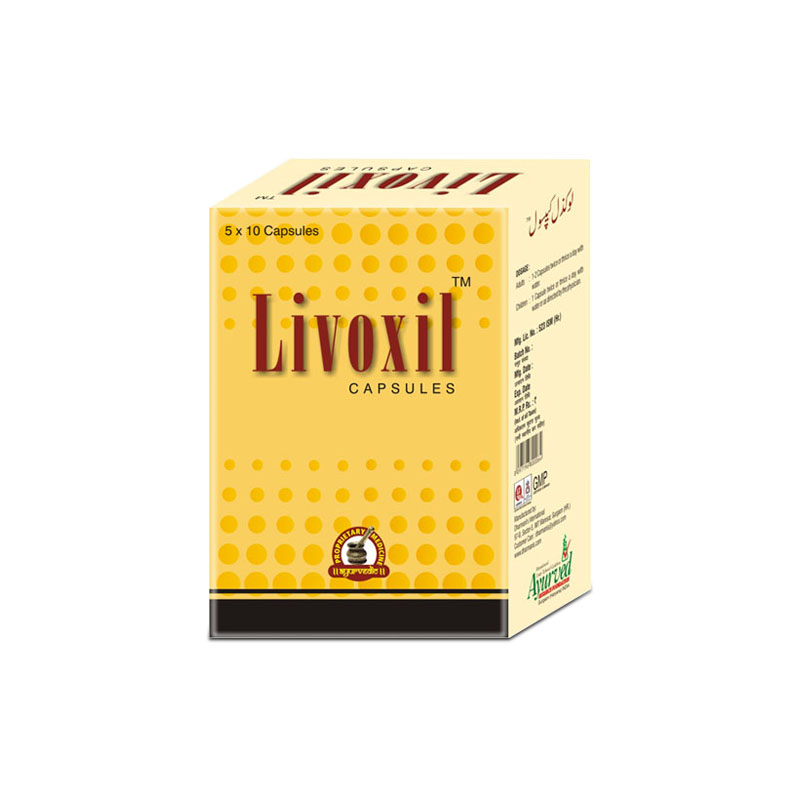 It prevents muscle spasms and frequent cramps occurring due to weakness or over-strain. This oil is mild on skin and can be used by people having sensitive skin as well. 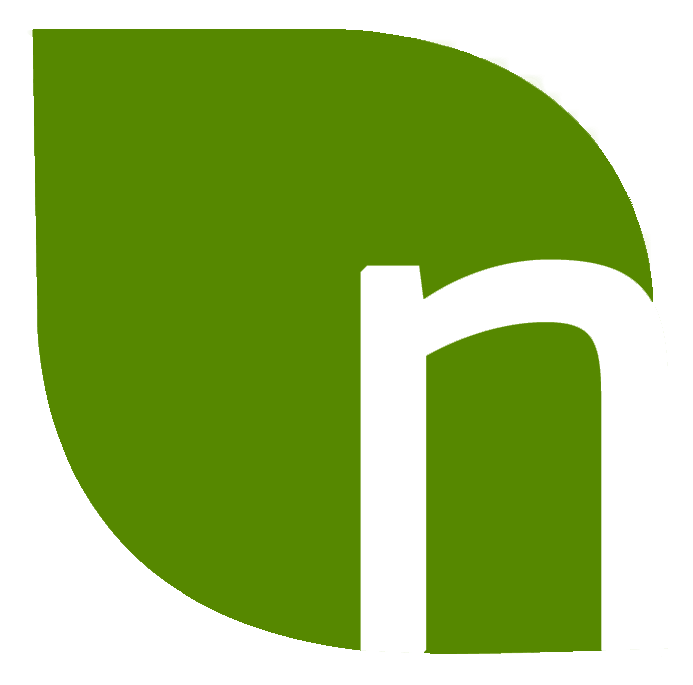 After trying allopathic treatment, I was pain free for a short period of time. This herbal product worked wonders for me. I feel a lot improved now. The stiffness is almost gone and I am relieved from the pain. 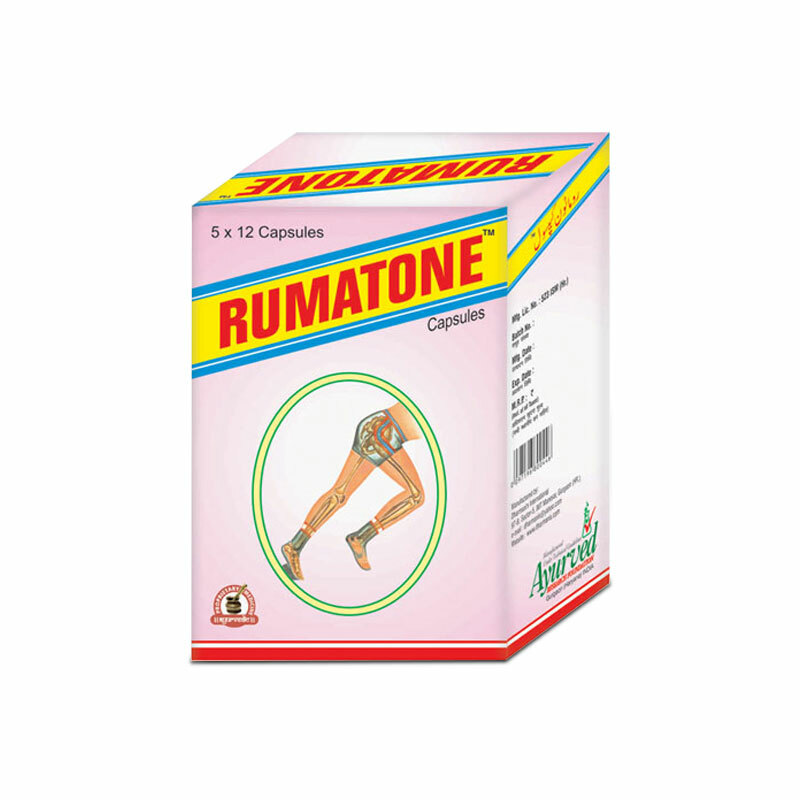 Rumatone capsules are specially developed herbal supplements for osteoarthritis which are made by blending time-tested herbs that relieve pain and improve joint stability. Rumatone capsules and oil are highly efficient natural supplements for osteoarthritis which are useful in relieving the intensity of OA and keep a person active for longer period in life.